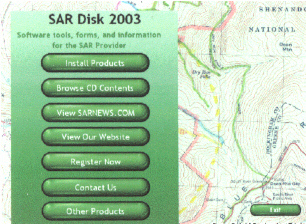 What new in the 2003 Version: USCG SAR plan addendum files, updated missing person statistics, map and compass training course, Incident Response Pocket Guide, Interagency Incident Business Handbook, FEMA IS-15 Special Event Planning, Digital Map Reading Software, e911Help call dispatch trail software, a new easy to use interface. The Following FEMA Urban Search and Rescue (USAR) Manuals: canine teams, equipment cache specifications, Incident Operations Support, Information and planning specialist, logistics specialist, medical specialist, and the structural collapse specialist manual. Over 333 SAR forms. Including forms from Bay Area SAR, cave rescue, CAP, dbS custom forms, MRA, NOAA, USCG, Kentucky, Maine, New Mexico, Virginia, Washington, and More. FEMA's independent study courses IS-1, IS-5, IS-10, IS-195 plus courses on Adult training, Briefing skills, and Interviewing skills. SAR mapping tools, templates, and grids. All the disk utilities required to view all the files (WinZip, Adobe Acrobat Reader 5.0, Word Reader, and PowerPoint Viewer).